Princess & the Paper presented by A Jillian Vance Design: Hope! I just love my new 2012 Ink Pink Limited Edition Stamp!!! Hope 2012 is a subway art type of background stamp, I got my inspiration from this years Breast Cancer fundraising bottle of Paul Mitchell Hot off the Press ~ which my mom uses on me everyday to flat iron my hair!!! If you use Distress markers with this stamp you can color in the word you want then you can stamp just that word if you desire! There are also three other words to use for sentiments! Great job on your card. Love the background and the layering. Thank you for sponsoring Link Up for Pink. Gorgeous card-- love this stamp set and I love the subway art! So pretty. 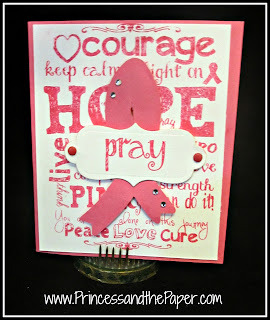 Thank you so much for creating with us at Link Up For Pink! Very lovely card... I'm enjoying using your stamps! Beautiful card! Thanks for joining us spread awareness at Link Up For Pink! Beautiful card!! Thanks for joining us spread awareness at Link Up For Pink!